Why is the Gillette #MeToo advert facing MASSIVE backlash? | SHEmazing! 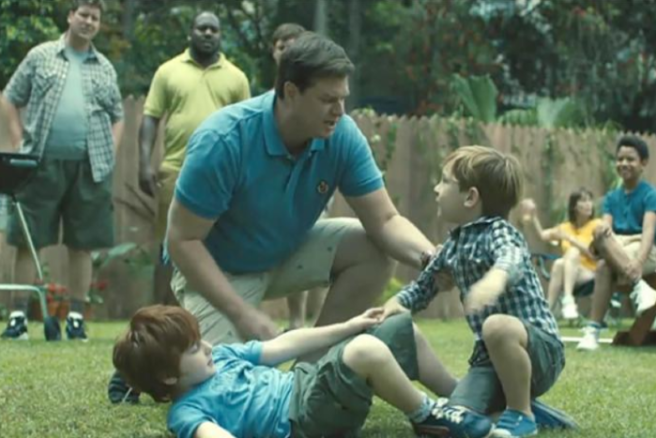 Gillette has made more than a few mortal, and almost exclusively male, enemies today after it debuted its brand new advert about toxic masculinity. The ad is currently trending on Twitter, having clocked up three million views already on YouTube as well as 282,000 dislikes. The two-minute clip opens up by showing men of varying ages and ethnicities staring into the mirror, before the narrator asking the question: 'Is this the best a man can get? ', turning its former brand mantra on its head. As the ad rolls on, it shows both negative and positive sides of supposedly 'masculine' behaviour, from bullying and harassment, sexual misconduct, 'mansplaining' and violence, to men standing up for sexual violence victims and acting as excellent father figures. The video faces the Me Too movement head on as a brand which has a predominantly male audience, and regularly aimed its former ad campaigns at gruff, typically 'masculine' men. Many viewers felt that the advert accepted its vital responsibility in speaking to their target audience, considering men have been notoriously at the heart of sexual assault allegations. One especially poignant part of the clip shows Terry Crews speaking out about sexual assault, crucially standing up for both male and female survivors and their Bill of Rights. On the one hand, Gillette's message slightly missed the mark by tarring an entire gender with mostly the same brush, though it did show varying 'types' of men. Some say the advert is capitalising on the #MeToo Movement, others say it's complete chastisement. The reception has been extremely mixed, with some of the target audience (all men) wanting to go as far as boycotting the brand forever, and others praising it immensely. One infamously vocal *cough* vile *cough* public figure to comment on it is, of course, Piers Morgan. The deplorable King of 'Boys will be boys' rhetoric himself has been arguing with members of the public ALL THE LIVELONG DAY on Twitter, claiming man-hating 'feminazis' are waging a war against men through advertising. As if advertising in essence isn't inherently waging a war against women. But whatever. Why has the advert received such an angry response? Many viewers believe that Gillette's efforts have created a video full of preaching, which isn't totally untrue. The video may have missed the mark with it's tone, after all, women know all about what condescension feels like. We experience patronising behaviour on a daily basis in the workplace, among other settings. It never teaches us the lesson it's attempting to, which for me is the main problem with the ad. I mean, the clip showing a line of men, standing behind BBQs with smoke wafting up from their grills, reciting “boys will be boys will be boys will be boys"? It's a bit obvious. That being said, the ad didn't even show the worst aspects of the patriarchy, the worst of the predators, the horrors many women face every single day. It didn't even go that far when we think about it from this perspective, but yet thousands are saying it went more than far enough. However, the ruthlessly aggressive response by some users to the video clip, in one way, reiterates the point. While I don't believe all men (or women) should be tarred with the same brush, I do believe that the defensive backlash shows the toxicity of the defensive feminist-fearing aggressive male dialogue. Like many women and men have said, only those who have done something wrong should be afraid of the Me Too era. By becoming an ally for sexual assault survivors, by proving you believe in equality, by acknowledging the pain which survivors of sexist behaviour and sexual violence have undergone, by lifting up women and minorities such as the LGBT+ and trans communities; only then will society believe that you aren't part of the problem. It's time for a lot of men to stand up and prove themselves; just because you haven't done anything wrong in the past doesn't mean that you can't stand up for what's right when it matters. And in today's Me Too society, it really matters. Seeing a massively popular brand attempt to start a conversation is encouraging for most of us, despite the fact that the ad was overdone and the tone was slightly missed. The male demographic clearly felt attacked by the ad (um, hello, EVERY MEDIA ADVERT makes women feel like sh*t about ourselves so now you understand how it feels) despite the fact that it was arguably trying to encourage them to better themselves for their own benefit. Let's not forget that toxic masculinity is harmful to men as well as women. While men are the perpetrators of 90% of violent crime in America, they are also 70% of the victims of violent crime. They are also four times more likely to commit suicide. By facing the aggression and violence inherent in society, men find gain too, yet so many of them are too angered by the ad to see that it isn't trying to attack them personally. "By holding each other accountable, eliminating excuses for bad behaviour, and supporting a new generation working towards their personal 'best,' we can help create positive change that will matter for years to come." No doubt Gillette anticipated a backlash to the clip, but all publicity is good publicity as the saying goes. Gillette has collaborated with the Building A Better Man project, which aims to reduce violent behaviour in men, and The Boys and Girls Club of America, which helps young men develop better communication skills. The company is also donating $1m a year to US charities who work to support men over the next three years. It has to be said that their efforts deserve praise, since #MeToo began there has been a shocking amount of defensive commentary from groups of men as opposed to constructive conversations and support for women and minorities suffering at the hands of the patriarchy. Gillette has rarely found itself in the midst of controversy, but today everyone is talking about them.